Tom Sawyer and Huck Finn are all grown up in this reimagined, modern day fable that finds them still searching for a hidden treasure that has eluded them since childhood. A modern-day retelling of Mark Twain’s iconic books, Band of Robbers is a comedic adventure that re-imagines the characters as grown men, and small-time crooks. When Huck Finn is released from prison, he hopes to leave his criminal life behind, but his lifelong friend, and corrupt cop, Tom Sawyer, has other plans. 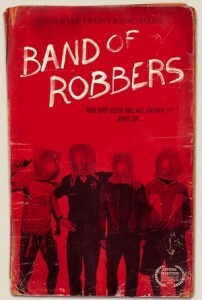 Not ready to give up on his childhood fantasies, Tom forms the Band of Robbers, recruiting their misfit friends, Joe Harper and Ben Rogers, to join them for an elaborate plan to find a fabled treasure. But the plan soon unravels, thrusting the guys on a wild journey with dangerous consequences. Band of Robbers premiered to stellar reviews out of LA Film Festival this year and stars Kyle Gallner (American Sniper, Dear White People, The Finest Hours), Adam Nee (Drunk History), Matthew Gray Gubler (Criminal Minds, 500 Days of Summer, The Life Aquatic with Steve Zissou), Hannibal Buress (SNL Emmy-nominated writer, Broad City, Neighbors), Melissa Benoist (Glee, Supergirl), Daniel Mora (The Bridge), Eric Christian Olsen (NCIS: Los Angeles), and Stephen Lang (Avatar films, Salem). Co-director Aaron Nee stops by for a conversation on this kinetic, funny and entertaining feature debut film. NEW YORK: At the AMC EMPIRE 25 co-director Adam Nee and cast Kyle Gallner and Hannibal Buress will be doing a Q&A. (More details coming soon.) Later at the Nitehawk Cinema a special 12:25 AM screening will be introduced by Adam, Hannibal and Kyle. This entry was posted in Academy Award nominee, adaptation, BAFTA Award Nominee, comedy, drama, dramedy, Film School interview, Indie by admin. Bookmark the permalink.